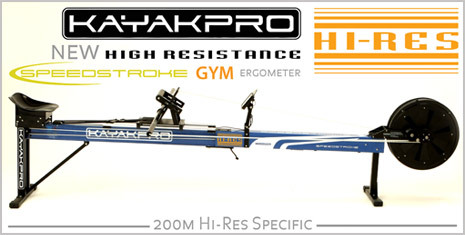 From KayakPro, the Makers of SpeedStroke, official suppliers of Ergometers to the 2004 Athens Games, 2006 Asian Games, 2008 Beijing Olympic Games, 2010 Asian Games, and 2012 London Olympic Games, comes SpeedStroke Gym - HI-RES Kayak. 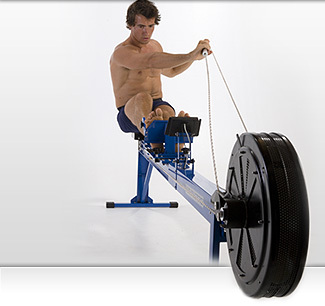 With the inclusion of 200m as an Olympic Discipline at the London Olympic Games - we have developed the Hi Resistance Speedstroke Kayak Ergometer. Outwardly the Hi-Resistance version looks the same- however we have increased the flywheel resistance to allow greater forces to be applied. Then in order to accommodate this higher resistance and the greater forces that are applied to this Ergometer- we have also strengthened many of the components - in order to withstand the increased forces and stresses place upon the SpeedStroke. Shaft, catch rollers, flywheel resistance have all been re-designed in order to allow this Hi-resistance upgrade to perform. The high-resistance Speedstroke GYM should not be confused with the standard model- as the paddling feeling will be quite different. The Hi -Res Speedstroke is a specialist product - designed specifically for Olympic and National teams to aide their preparation for the 200m Olympic events.